Andrew Gwynne MP has this week stood alongside fellow MPs and animal welfare charities Cats Protection and Battersea Dogs & Cats Home in discussing feline welfare. The All Party Parliamentary Group (APPG) on cats, which launched last Tuesday, will lobby for law changes to improve protections for cats and their owners. 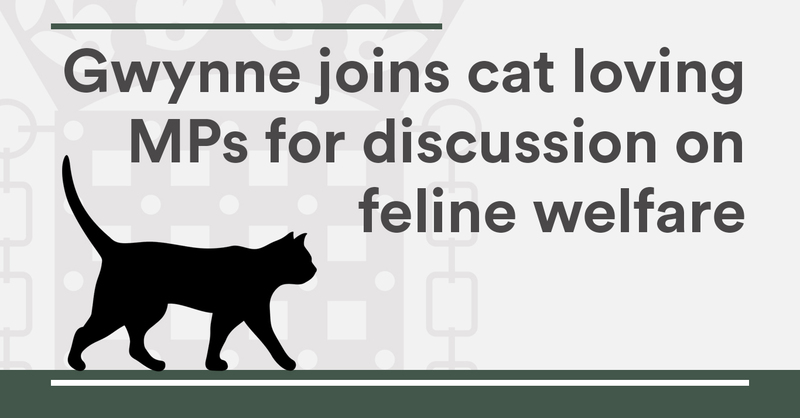 The new group will focus on feline welfare and how to tackle key cat issues, such as toxins contained in antifreeze and laws on air guns, as well as highlighting the benefits of owning a cat to combat loneliness. Cats currently do not have the same rights as dogs in road traffic accidents, with drivers legally allowed to drive on without reporting the incident, unlike with their canine counterparts. “As the proud owner of three cats, I want to make sure the law protects our feline friends. There are millions of cat owners up and down the country, and it is right that the spot line is being shone upon their legal protection. “As one of the UK’s leading animal welfare charities, we’re ready to start work with politicians and other charities to raise the profile of issues affecting cats, who are loved in their millions across the country. We have a petition to Reclassify the theft of a pet to a specific crime in its own right. Could this be of interest to APPG ?